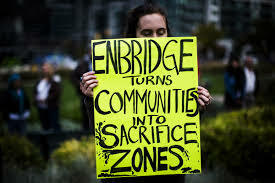 The National Energy Board (NEB) yesterday gave the green light to Enbridge Inc.’s contentious Line 9B pipeline, despite the company’s failure to make necessary safety improvements. The decision means that critical safety measures will not be implemented before Enbridge starts running highly volatile tar sands crude oil through the 40 year-old pipeline. The pipeline crosses every tributary to much of southern Ontario’s water supply.